The Cultural Centre of European Space Technologies (KSEVT) was jointly designed by four Slovenian architectural firms: Bevk Perović, Dekleva Gregorič Architects, OFIS Architects and Sadar Vuga. Besides special programme and location, the collaboration of four architectural offices in developing the project is unique. The idea of collaboration raised on the first meeting where investor invited the four offices to collaborate on internal competition – and office principals decided to actually rather do the project together. 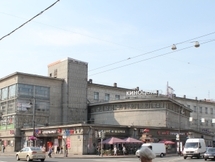 The building design takes inspiration from the first geostationary space station, or to be more precise the habitation wheel space station envisaged by rocket engineer Herman Potočnik Noordung (1929). With its program the KSEVT will substantially supplement and emphasize the local cultural and social activities of the former Community Centre in Vitanje town with additional cultural events (exhibitions, events) and scientific activities (research, conferences) strongly connected to the culturalisation of the space. The building features a series of interlocking rings that lie on top of each other to create a continuous ramped structure. The upper part of the building houses a research area, while the lower parts will house exhibition spaces, a multi-purpose hall and local library. Noordnung’s space station was designed as a geostationary satellite out of three parts: a solar power station, an observatory and a habitable wheel. After several decades of ponderings on the habitation of space, this idea remains to be the most revolutionary, yet not realized. The rotating habitable wheel, a circular construction setting up artificial gravity with the centrifugal force, is the best and at the same time a simple solution for long-term human habitation of weightlessness. The building is a monolithic concrete structure, positioned freely between a main road on one side and a stream with a green hinterland on the other. The exterior and interior of the building are made of two low cylinders. The bottom one is larger and rises from the North to the South, while the upper cylinder is smaller and joins the larger one on the south while rising to the North. 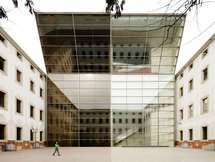 The bottom cylinder is supported by the transparent surface of the entrance glazing. From the exterior, there is a dynamic effect between the cylinders, accentuated by the full glass rings around the building. The building appears to float and rotate on its southern and western sides towards the road. The entrenchment of the building into the surface on the other side gives a connection to its immediate surroundings. The spatial effects give the building the effect of artificial gravity from floatation and rotation. The building has two entrances, a main one to the central space from the square in front of the building on the south-eastern side and the northern entrance from the gravel surface above the stream.